The weight structure of the Consumer Price Index 2015=100 is based on national accounts data on private consumption. The data are updated annually. 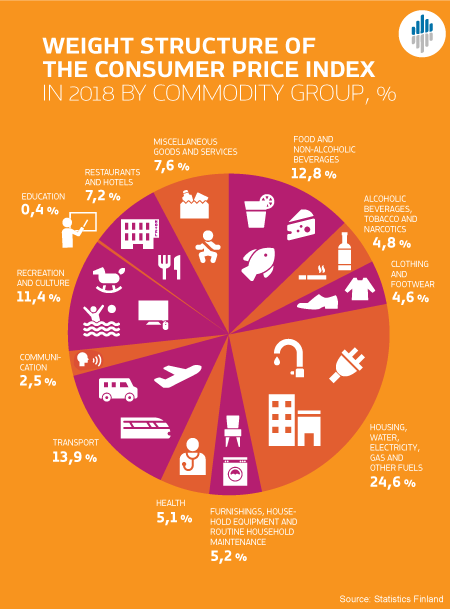 The weight structure for 2018 corresponds to the value of private consumption in 2017, which was EUR 104 billion. National accounts data on consumption expenditure are only available at a rough level. To the extent that the division of consumption items is not accurate enough, the weight of the rough level is divided into sub-items, primarily with the help of the Household Budget Survey. In addition, sub-items are defined by using statistical data produced by other statistics, the Bank of Finland's statistics and sales data of central retail corporations and unions. The figure compares three different base years. Group 04 Housing, water, electricity, gas and other fuels has had the biggest weight values in the past ten years. The value share of group 01 Food and non-alcoholic beverages is still falling. The index calculation is based on a commodity basket that is updated annually along with changes taking place in consumption. Commodities whose consumption is at least one per mil or more of total consumption are added to the commodity basket and commodities whose value share has fallen under one per mil of total consumption are removed. With the help of commodities that are now updated annually and their value shares, the representation of the most typical products and services in the Index is ensured. Previously, prior to 2013, the weight structure of the Consumer Price Index was updated every five years. From the beginning of 2018, the commodities added to the commodity basket were veggie burger, protein bar, music streaming services, and strong cider, strong long drink and strong beer that are included in the selection of retail shops as a result of the Alcohol Act of 1 January 2018. Due to decreased consumption, the items removed from the commodity basket were ready-made hamburger, cooking margarine, repair of a washing machine, landline telephone call charges, video camera, photo service and entertainment events. After the update, the commodity basket contains 467 products and services. Figure 2 presents the structure of private consumption by commodity group. Changes in the prices of commodities in the group having grown their value shares have now more effect on the Consumer Price Index than before. Correspondingly in groups where the value shares dropped, the changes in these prices have less effect on changes in the Consumer Price Index. The Finnish Harmonised Index of Consumer Prices is mainly based on the same weight and price data as the Finnish national Consumer Price Index, but its commodity selection is narrower. It does not include owner-occupancy, games of chance, interests and tax-like payments. The Harmonised Index of Consumer Prices covers 85 per cent of the national Consumer Price Index. The value shares of commodities shown in the table have remained more or less on level with the previous year. Compared with 2013, the value share of the removed commodities has risen from 12.05 to 15.09 per cent. ISSN=1799-0254. January 2018, Weight structure and commodity basket of the Consumer Price Index are updated for the year 2018 . Helsinki: Statistics Finland [referred: 25.4.2019].